BEIRUT—As the U.S.-led coalition presses ahead with its air campaign against Islamic State and other militant groups in Syria, the tug of war among regional and world powers over Lebanon is intensifying. The Syrian regime, Russia and Iran—through their local ally Hezbollah—are pressing the Lebanese government and its security forces to lend support in the widening regional conflict. A visiting senior Iranian official publicly offered the Lebanese army an unspecified grant on Tuesday to help fight “the wicked terrorism” on the border with Syria. “The [U.S.-led] coalition is meaningless in the fight against terror and the coming days will prove it,” Ali Shamkhani, the secretary of Iran’s powerful Supreme National Security Council, said before traveling to Damascus for meetings with Syrian President Bashar al-Assad. Opposing this pro-Iranian and pro-Assad alliance are the U.S., Saudi Arabia and other Arab and Western powers. 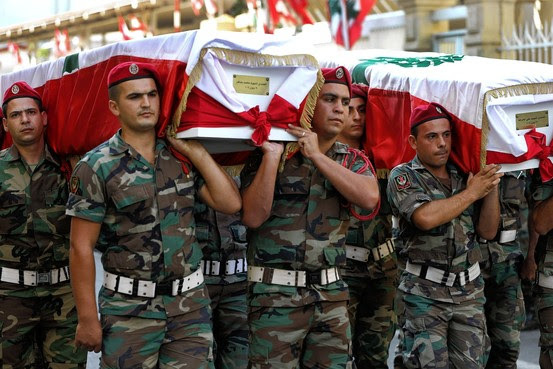 With the anti-Islamic State campaign widening to Syria and creeping closer to Lebanon’s borders, those countries are seeking—also through their local allies—to shore up the support of the Lebanese government and its military. Lebanese Interior Minister Nohad Machnouk told The Wall Street Journal recently that the U.S. would supply the country with nearly $150 million in military and security equipment, paid for from a $3 billion Saudi gift to Lebanon’s armed forces announced at the end of 2013. Serving as an arena for proxy battles between larger and more powerful nations is nothing new for Lebanon, a small country of about four million on the Mediterranean, sandwiched between Israel and Syria. Since gaining independence from France seven decades ago and through the aftermath of the 1975-90 civil war, Lebanon has been a stage for regional and international power plays. Now, along with Iraq and Syria, its integrity as a state is again being tested. The decision by the Shiite political and military group Hezbollah to defend Mr. Assad’s regime by dispatching its own fighters to Syria has enmeshed Lebanon deeply in the civil war there. And the war’s repercussions have rebounded to every corner of this country. Lebanon is awash with 1.5 million refugees from the fighting in Syria, a number that some officials predict will surpass two million by early next year. The resulting strains on the social fabric, infrastructure and economy are expected to produce cumulative losses of $7.5 billion in gross domestic product for the three years 2012-14, according to the World Bank. Since early this year, Hezbollah and Syrian government forces have been battling Islamist-dominated rebels in Syria’s Qalamoun region, which abuts the border with Lebanon. In recent months, the fighting has spread across the frontier to the Lebanese town of Arsal, forcing the Lebanese government to deploy the army to the area. The al Qaeda-linked Nusra Front and fighters affiliated to Islamic State, both battling the Assad regime, have been holding more than 20 captured Lebanese soldiers for a month. They are threatening to kill them unless Hezbollah pulls out of Syria and militants imprisoned in Lebanon are released. Three soldiers have been executed, and one was freed on Tuesday. At least 48 people, mostly children, were killed in a double bombing outside a school in the mostly Alawite neighborhood of Akremah in the central Syrian city of Homs, the monitoring group Syrian Observatory for Human Rights said. In all, the Syrian crisis has exacerbated sectarian and political tensions and increased attacks against Syrian refugees. It also threatens to weaken the government and army, which are struggling to preserve the delicate political arrangements that have largely succeeded in maintaining a measure of stability in Lebanon since the end of its civil war. Fawaz Gerges, a professor of international relations at the London School of Economics and Political Science, said the expanded campaign against Islamic State in Syria was bound to fray the long-standing consensus among regional powers aimed at ensuring stability in Lebanon and bring more turmoil to its borders. This anxiety underpins the pronouncements of Mr. Shamkhani this week in Beirut and Damascus and those of Hezbollah chief Hassan Nasrallah last week. In a televised speech, Mr. Nasrallah said his group opposes all efforts to include Lebanon in the coalition against Islamic State, also known as ISIS. “The Lebanese, Iraqis, Syrians and all people of the region have the right to be suspicious of America’s motives,” he said. Hezbollah is meanwhile pushing hard for military cooperation between the Lebanese and Syrian armies, especially in Qalamoun. Such cooperation has been almost nonexistent since Syrian withdrew its troops from Lebanon in 2005. “The Syrian regime is looking to gain legitimacy because when they impose security cooperation and coordination openly with Lebanon in the Qalamoun, this means they are de facto part of the war on terror in the region,” said Ahmad Fatfat, a member of parliament from a bloc with close ties to Saudi Arabia. Samir Geagea, a Lebanese political leader and one of the Syrian regime’s fiercest opponents, said he and his allies would seek to prevent such cooperation. “Lebanon’s best interests lie in joining the coalition against ISIS,” said Mr. Geagea.